Home Announcements Announcing the Monthly Theme Contest NEW Rules & Prizes! 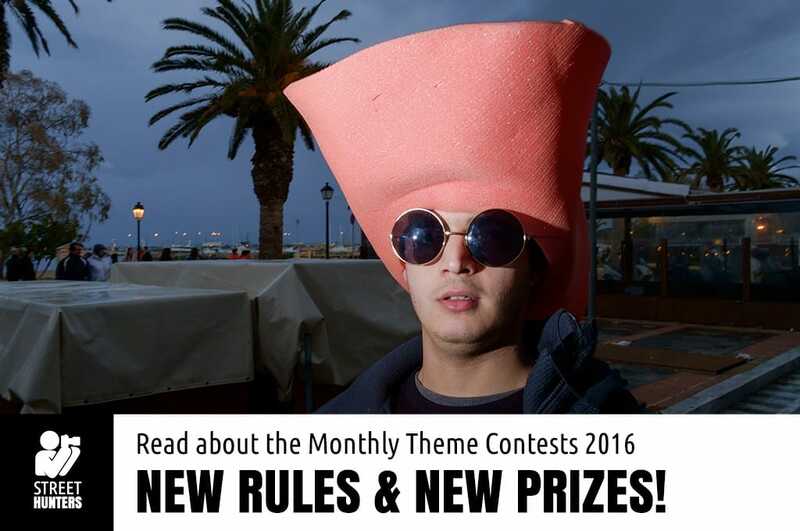 Announcing the Monthly Theme Contest NEW Rules & Prizes! 2016 is here and the team at www.streethunters.net is ready for one more year of exciting Street Photography! We have different tricks up our sleeve for the following year. We plan on making Street Hunters more interactive and more involved. This is the 3rd year that we have been around and since we first launched many things have changed for us. But, what is most important is that we have made many new friends and have discovered hundreds of amazing new Street Photographers from all over the world. This post isn’t about our plans though. We would rather let them unfold smoothly during the year. There is no point in announcing everything from today. Where would the mystery be in that?! No, this post is going to focus on one of the many major changes that is going to take place in 2016 and that is how the Monthly Theme Contests are going to work. During the last year, we have been receiving many, many photos from you as submissions to our Monthly Theme Contests. What we have noticed most of the times, is that the photo belonging to the Street Photographer with the most Social Media friends wins. When we first initiated these contests, we wanted the best photos submitted to win, so they could then be added to the official Street Hunters calendar. Our goal was for the most interesting photo, or one of the most interesting photos to win in the competitions. In quite a few circumstances, outstanding photos didn’t win. Photos that were clearly better than the winning ones. So, we researched and found out that some of the 2015 winners were asking their online friends for votes. This made the contest unfair in our eyes and for this reason, we have decided to change the rules. So, from now on, you will be asked to submit your photos, just as you always did but we will not select the TOP 10 and share them with you so you can vote for your favourite. What we will do is share ALL photos with you and we will then each pick a personal favourite photo. Andrew will pick one, Digby will pick one and I will pick one. Those 3 photos will be the month’s finalists and they will be announced sometime in the middle of each month. 10-15 days later, we will announce the winning photo of the 3 finalists and we will also write the reason why that photo has one. For example it has an amazing composition, or terrific light, etc. This way, the Streethunters.net Monthly Theme contests will not be affected by Social Media popularity, but will be chosen by us, the Streethunters.net team. All the Monthly Theme Contests of 2016 will be sponsored by our friends at COSYSPEED. So our winners, in addition to winning a place in the Streethunters.net Calendar and being exposed on all Streethunters.net Social media for a whole month, will also receive a COSYSPEED Camslinger 160 Street Edition or a COSYSPEED Streetomatic camera bag! COSYSPEED, thank you for your constant support of the Street Photography community! So stay tuned for the new contest that will be announced soon along with the subjects for all the Monthly Theme Contests for 2016! It seems the best and democratic way to find always the best picture well done! Thank you for your opinion Pedro. Good idea Spyros. Mass voting is rarely fair these days. Indeed Forrest. This was the main reason for the change. Thanks for commenting. I like the new rules.. The new method seems to insure honest criticality based on accepted standards. I would much rather have a panel of knowledgable and experienced photographers judge me than a population of folks who often are more impressed with flash and “flavor of the month” populist trends rather than acknowledged objective criteria. From the photos seen online there seems to be enough differences in your individual styles to insure a good composite evaluation. Thank you very much for your opinion Allen. We are pleased you find the new method to your liking. The next competition subjects are included in our post here http://www.streethunters.net/blog/2016/01/21/january-2016-monthly-theme-contest-layers/. Thank you! Hi Jimmy Lee! Visit http://www.streethunters.net/blog/2016/01/21/january-2016-monthly-theme-contest-layers/ for more info. Thanks! Hi Jimmy Lee! You can find the next subjects here http://www.streethunters.net/blog/2016/01/21/january-2016-monthly-theme-contest-layers/. Stay Sharp & Keep Shooting! Hello Melanie! No, you don’t need to sign up to anything, just follow the blog posts and send your submissions to our mailbox when we request them.